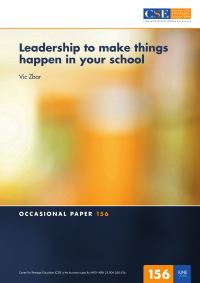 The author explores the relationship between leadership and achieving improvement in schools, drawing upon his experience in working regularly with schools, as well as a project he undertook for the Queensland Educational Leadership Institute during 2017. He discusses the work that leaders do; the development of a leadership framework, and some of the related challenges; the preconditions for, and stages of, whole-school improvement; framework elements and the thinking behind them; and how to ensure progress and keep on track. He concludes that achieving successful improvement remains easier said than done, and requires both leaders and those they lead to go beyond their comfort zones.